A DTP system does not only involve a printer, inks and fabrics. A complete set of peripherals is necessary to be able to obtain the best results. In this article, Maria José Leaño presents a series of machines for pre- and post-treatment, based on many years of experience and with quality in mind. It is not that simple to enter a digital textile printing (DTP) business. Even experienced printers find it difficult to decide which machinery is best suited for this purpose. Most of the time, the focus is on the printer only: is it fast and wide enough and also capable of printing on all kinds of fabrics for a low price? This, however, is not the most important issue. A DTP system does not only involve a printer, inks and fabrics. A complete set of peripherals is necessary to be able to obtain the best results. When starting the process of choosing a good system, it is best to start at the finish: who is my client and what product do I want to offer? In general, printing companies are inclined to start small and want to offer most clients the best service and products. It is popular belief that starting a digital printing business with a big investment will cause it to fail. But why not start with the best there is? to start a digital textile printing business. There are many experienced printing professionals around nowadays who can advise you on starting a business. Sales people can inform you about the characteristics of a machine, but why not ask the printing professionals, who are experienced in using the machines, for advice as well? A good printer that prints on any type of fabric is not necessarily a good one. Before buying a printer it is important to decide which kind of customers you are aiming to offer the service to. Polyester digital sublimation systems are popular when offering low-cost versatility, but synthetic fabrics are not ideal for high-end fashion businesses. If you are looking for a system to offer exclusive products, you should concentrate on systems that can print on the best quality cotton, silk and wool. The recommended systems for this are acid (silks and nylon) and reactive dyes (cotton, wool and silk), or better still, a system of pigments that will allow printing on all such bases including blends. Never buy machines that have two-ink systems. It may seem that such machines are suitable for printing on all kinds of fabrics, but they will turn out to be machines that print at half-speed. Moreover, when materials need to be changed, a complete cleaning process of the machine will be needed to change from one ink system to another. It is also important to take into account the width of the fabrics that you are going to print. Most fabrics for fashion design come in widths ranging from 1.10m to 1.60m, so a 1.8m wide machine should be enough to start with. Wider fabrics are generally used for decoration and industrial applications, so if that is the purpose, machines of over two and three meters wide will be needed. The printing speed is equally important. If your business is going to offer exclusive fabrics, it will not be necessary to obtain a machine that prints at a very high speed. In fact, exclusiveness is based on printing small quantities. If the printer is very fast, changing designs can become a problem as printers demand stopping the entire system for a change of motif. Fast machines are only suitable when more than 100 meters need to be produced. 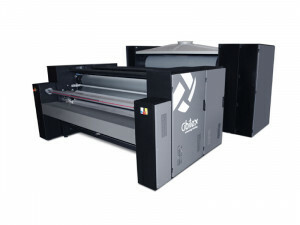 Most textile printing systems require prior preparation of the fabric. The chemical preparation that must be added depends on each type of ink. The formula is given by the inks supplier and must be applied evenly onto the fabric. Formerly, an industrial padding system could be used to this end, but those machines are so large that it is only material. Therefore, compact systems have been developed for digital printing. EasyCoat/Dry is a good example. This machine not only allows you to add the necessary chemicals to the fabric for a better impression, but will also dry and roll the fabric after treatment or at the end of a washing cycle. The system is designed to use a minimum of water and chemicals and reduce waste. Furthermore, it is digitally driven to optimize speed, depending on the tension needed for each fabric. This is important for elastic fabrics that can get damaged if the tension is very high. It has a system of curing and drying at 200 °C (if necessary), making the fabric ready for the next complete drying process, which is done in the same machine. Finally, it has an integrated winding system that leaves the finished fabric ready for the next finishing process, for instance a steaming one. This machine can also apply other industrial finishing chemicals, such as softeners or antiflame, like any industrial branch would do. EasyCoat is recommended for systems of acid dyes, reagents and pigments. It is important to emphasize that for a pigment system, this machine will be sufficient for the complete process, while for reagents and acids, components have to be added. In a previous article, the impression was compared with pigments with and without pre-treatment. The difference lied in the brilliance of the colors and the resistance to use and washing, a very important factor in exclusive high-quality fabrics. Reagents and acids cannot be printed without coating. 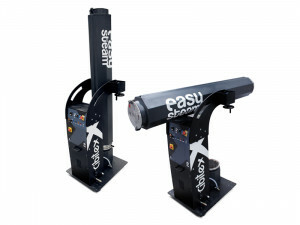 The easySteam is a bullet-shaped vaporizer, especially designed for small amounts of fabrics, which makes it a very useful peripheral in an exclusive printing business. Comparable to pretreatment, vaporization is essential for fixing acid and reactive dyes. It is completely digitally controlled, using sensors that indicate if everything is working well while vaporizing. The amount of steam and the duration of each cycle depend on the type and amount of fabric. It takes up to 15 kg of cloth (50 meters of fabric) and vaporizes up to 102 °C, using a minimum of water. It has a filtering and smoothing system that protects the machine from abrasion and that reduces maintenance costs. After printing and steaming, it is essential to wash away all the applied chemicals from the fabric, including the exceeding dye that has not been fixed to the fabric and could stain it later. 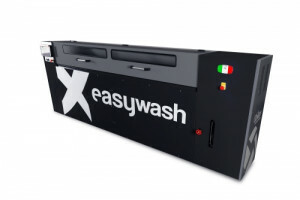 Cibitex presents easyWash, a compact washing machine that does not need much space and also saves more water and energy than traditional washing plants. The machine takes up to 200 meters of fabric (depending on its thickness) and washes it in less than an hour. It has a mixing system for additives needed for a better finish, independent water tanks for a better washing process and an adjustment system that can be used for washing different widths of fabric and for the edge control. Washing is recommended for DTP with acid and reactive dyes, but can also be used for a better finishing of pigment and to disperse inks. Machines are getting smaller. Sizes mainly depend on the width of the printed fabric. Still, it is important to make sure that there is enough space for all the machines you need. The printer must be included, as well as lots of working space and a special area for designers. A dry area must be reserved for the fabric rolls. They must be kept away from the steaming machines and from the printer. The printer requires a controlled room with low humidity and constant medium temperature. A good energy and water supply is needed as well. A high-end printing business has to make a choice between dyes or pigments. Pigments have been developed to the point where they can compete with dyes in almost all cases. For comparison, for reactive and acid dyes, easyCoat/Dry, easySteam and easyWash are needed besides the printer. For pigments, easyCoat/Dry is needed and easyWash is optional. EasyLine series is offered by Cibitex and has a green certification by Acimit Green Label, a document that identifies and recognizes the energy and environmental performance of textile machinery. Cibitex is ranked two stars by the Italian Antitrust Authority in the Legality Rating program. All Cibitex products are designed and built in Italy and have a “made in Italy” quality guarantee. The information gathered for this article was obtained thanks to Andicolor S.A (www.andicolor.com) and Cibitex (www. cibitex.it). For more information please contact Maria José Leaño at www.